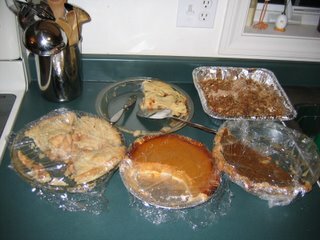 After having three Thanksgiving dinners (our annual tradition - one in MD with relatives the week prior to the actual holiday, one on Thanksgiving Day, and one on Friday) we had plenty of leftovers to show for it. Hubby made quick work of the turkey and fixings, but as of Saturday night these were still around. As of this morning, there is 2 slices of squash pie left......I hope everyone had a wonderful, filling Thanksgiving! On the knitting front, as promised, finished Banff! I love how it fits - just as intended - oversized and cuddly. I do have to re-bind off the neck though. It is a little tight, so I think I'll go up to a bigger needle size and redo it. Other than that, it's perfect! 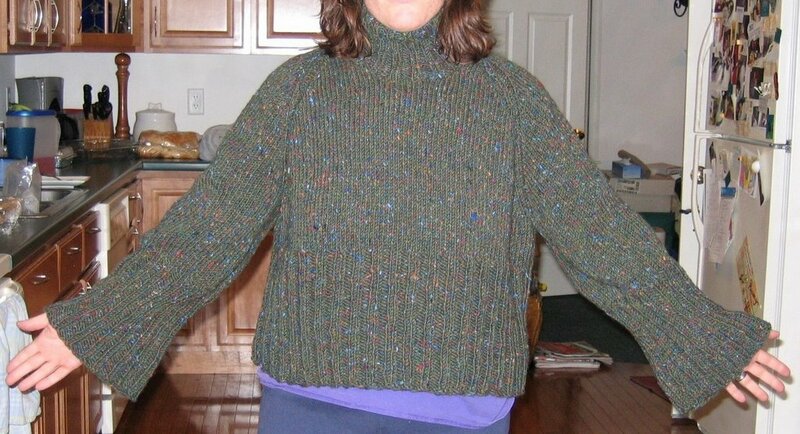 I finished Dublin Bay #2 after a fury of knitting during football yesterday. 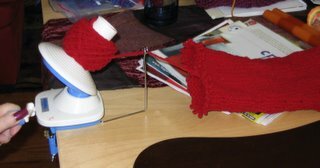 Now I kind of understand how people can finish socks so quick. But, after holding it up against #1, this one is a good 1.5" shorter! What gives??? So, I'm ripping back and re-knitting. Ugh. I want to start Jaywalker, so I'm determined to finish these! I am about 3 rows into the Tahki sweater - not sure if I'm liking how the yarn is knitting up for this. The gauge may be too big for it. I'll knit a little further and see how it goes. I wish they made size 12 needles. My gauge on 11's didn't work, and on 13's it was too big! I'll have to fudge a little. This sweater is so oversized, I'm not too concerned. A great little treat came in the mail on Friday. I got my free yarn samples from Webs! They sent about 6" lengths of their house yarns. All I can say is that I will be making something out of them. They felt wonderful, and the colors!! !